October is the month when the journey south begins. Whether they were born in Wisconsin (eastern flock) or Canada (western flock), baby cranes must be taught their migration route. 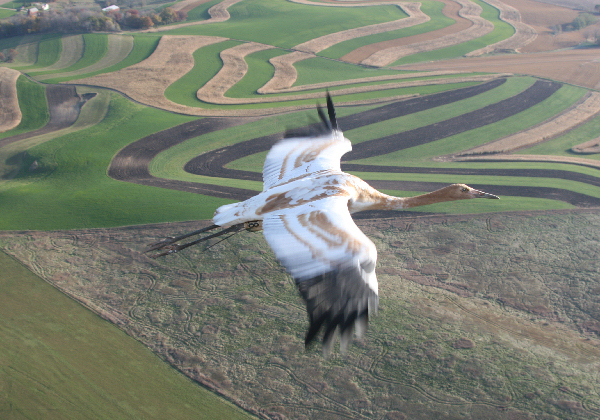 In Wisconsin, crane chicks were hand raised each summer from 2001 to 2015 and trained to follow an ultralight airplane to learn their 1,280-mile migration route south to Florida, the wintering grounds for the eastern migratory flock. With a shorter journey south, adult cranes in the eastern flock can leave later than their northern Canadian-born cousins. Meanwhile, the larger western flock in Canada is already underway, as their migration to the Gulf Coast of Texas is twice as far as the eastern flock's to Florida. All the summer's babies learn not only the route between their summer and winter homes, but the preferred stopover sites as they're led on their first migration south. The youngsters need to fly the route only once to remember it for the rest of their lives.